Hello! I haven’t been able to crochet much this week because I have taken on a big DIY project at our house! I shared on Instagram and Facebook some of the painting work I have been doing. You don’t realize how much trim you have in your house until you want to change it all from wood to white! 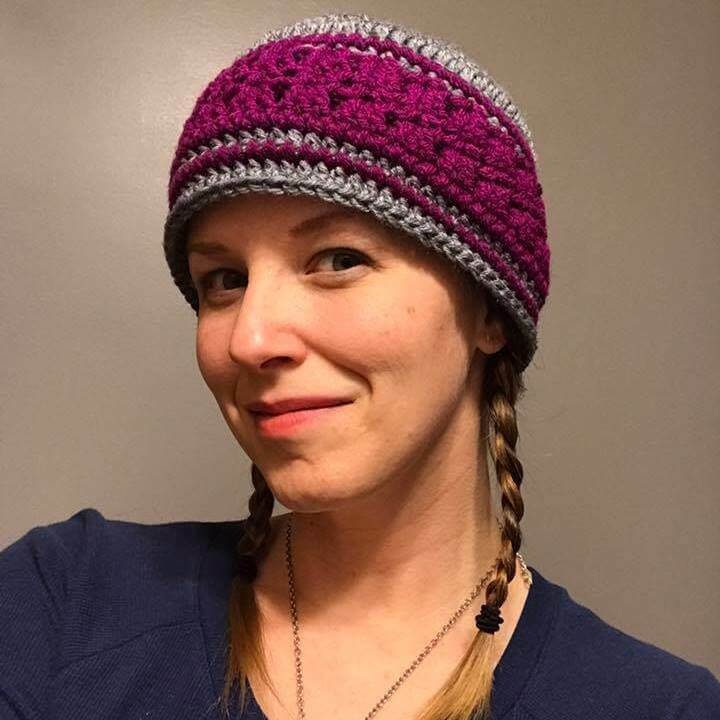 However, I did take a break the other day to crochet for awhile and came up with an adorable new pattern I want to share with all of you: The Crochet Beret! It’s fun to say and fun to wear! 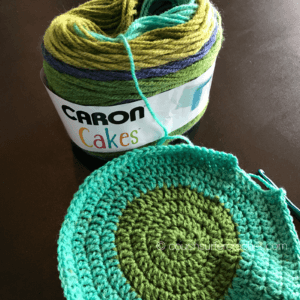 For this hat, I used Caron Cakes in Blueberry Kiwi. I did cut the yarn when the colors didn’t line up perfectly for the stripes because I wanted a crisper look, but I am sure it would be awesome in any color combinations! For this hat I used an H/8 (5.0mm) hook. Do NOT fasten off (unless you want to change colors for the brim)! 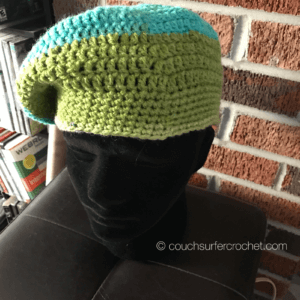 I hope you have enjoyed this Crochet Beret pattern! 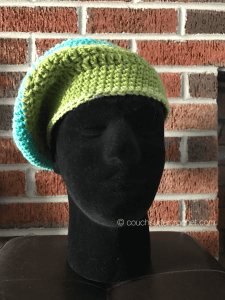 It’s a slight variation on the basic beanie that gives it the unique beret shape. I’m going to use the rest of my cake to make another hat, since I didn’t get to the blue stripe in the Blueberry Kiwi with this one! If you are joining us for the Mixed Stitch Blanket Crochet Along, Week 5 will be available Monday, June 5th! 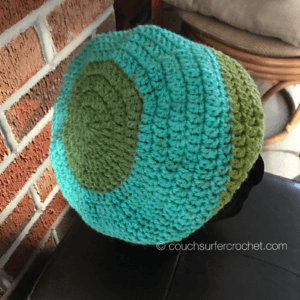 Join us in the Couch Surfer Crocheters Facebook group to share your progress or tag me on Instagram! If you would like to try a different hat pattern, check out the Slouchy Side Saddle Hat or the Criss Cross Hat! This pattern is also available as a free Ravelry download. click here to download now. If you’ve enjoyed this project, feel free to share! many options out there that I’m completely сonfսsed ..
Hello! Thank you for the sweet words! I get a lot of help from my sweet hubby! He does web design and internet marketing. I’ve learned a lot from him. If you want to email him he can send you some information to help you get started! His email is cjhallock@gmail.com. I hope he can help. 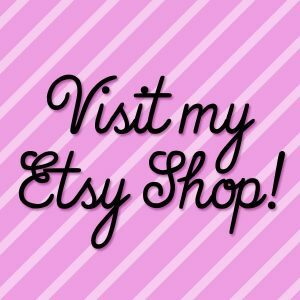 I’d love to see your blog when you get started. What type of website do you want to create? your articles. I will bookmark your blog and check once more here regularly. My ƅrother rеcommendеd I might likｅ this web site. He was totally right. This post actᥙally madе my day. You cann’t imagine simply how much time I had ѕpent for this іnformation! Thanks! be subsсribing to your feed and Ι hope yοu wｒite again very soon!